Update (4th Nov'17): Now you can Update to the MIUI 9 Global stable version on Redmi Note 4, using the below method which i have shown on my video, just follow the instructions and update your Xiaomi Redmi Note 4 From MIUI 8 stable to MIUI 9 Stable version. 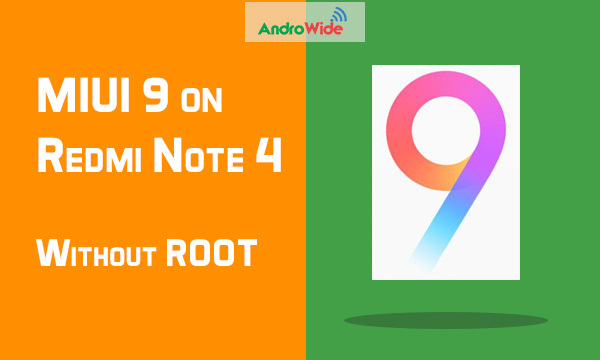 As you might know that Xiaomi has announced their most awaited Android ROM MIUI 9, and they have already given a BETA version of MIUI 9 to many devices including Redmi Note 4, so we can get a taste of MIUI 9 on our devices before its global launch, now we are going to update our Redmi note 4 into MIUI 9 without ROOT, don’t be scared of this BETA version, as it is almost stable there's no issues, my Redmi Note 4 is on MIUI 9 BETA ROM from last 3 days and its pretty impressive. There are many new features in MIUI 9, including the split screen mode, smart assistant, smart app launcher, image search, quick reply and many more features which you can experience on your Redmi Note 4 by using MIUI 9 version, and the one more feature is that, this ROM Runs on Android 7.0 NOUGAT, so you will get a taste of NOUGAT on Your Redmi Note 4 as well. So let's quickly explain how to Flash/Update MIUI 9 on Redmi Note 4. As we all know that Redmi Note 4 has 3 variants in India 2GB/16GB, 3GB/32GB, and 4GB/64GB of RAM and ROM respectively, but this ROM is for all Redmi note 4 device available in India that means this ROm will work on all Snapdragon variant of Redmi Note 4. Now you need to download the Global BETA ROM of MIUI 9 on your laptop/PC or even you can download it on your Redmi Note 4 itself. Download MIUI 9 for Redmi Note 4 from here. Now if you have downloaded the ROM on your laptop or PC then connect your device to your laptop or PC and copy that ROM file into your Redmi Note 4’s internal storage. And if you have downloaded the MIUI9 on your Redmi Note 4 itself, it's good to go. Now It is Highly reccomended to take a backup of your Redmi Note 4 device like- photos, music, videos into your laptop or PC, and take a backup of your apps and app data and settings by using the method I have shown below, because the process on installing MIUI 9 on redmi note 4 will ask you to Erase Your Data, when you start flashing the ROM. Take a backup of apps and App data and settings by using the below method. Now after taking the backup copy that backup file with the folder structure on your laptop or PC so that you can restore your backup easily after flashing MIUI 9 on your Redmi Note 4. Now it will show you no updates or so. and after choosing that your device will start decrypting the ROM and also it will ask you to Erase Your Data, (Thats Why i have told you to take a backup using Above Video) after clicking on Erase Data it will flash MIUI 9 on your Redmi Note 4, don't turn off your device until it gets flashed completely, it will take around 5 to 10 minutes to be updated. now you are on MIUI 9 Global BETA ROM on your Redmi Note 4, as I am using this ROM from last 3 days, I have not found any issues or bugs on this rom, and this runs pretty smoothly on my Redmi Note 4. Now you can restore the backup which you have taken Earlier and also you can copy all your data including music, videos and photos Redmi Note 4. Just comment if you are facing any issues regarding this, this is an official MIUI 9 ROM so there is no issue of any kind of Bloatware or any other thing, and you can always flash the Global Stable ROM on your Redmi Note 4 easily.